1 article tagged "24C Label". Dual Magnum® has had a special local needs (24C) label in Indiana for use on transplanted bell peppers and other vegetables for a number of years. Last week the label was amended to include additional small fruit and vegetable crops, including asparagus. 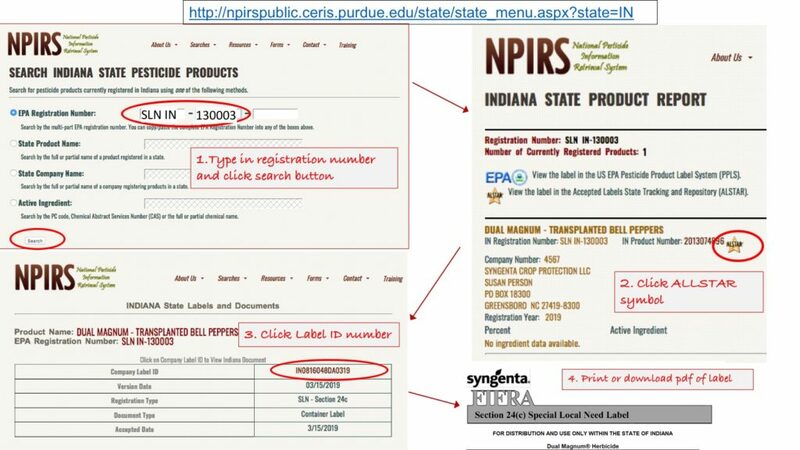 The new 24C label is available on the National Pesticide Information Retrieval System web site: http://npirspublic.ceris.purdue.edu/state/state_menu.aspx?state=IN. To find it, type “SLN IN” and “130003” in the first two boxes for “EPA Registration Number” and click the search button. The product report will show “DUAL MAGNUM – TRANSPLANTED BELL PEPPERS.” Click on the ALLSTAR symbol. On the page that opens, click on the Company Label ID number “IN0816048DA0319.” This will open a pdf of the label. If you decide to use the product, carefully read and follow the label instructions.